Episode 1 of Season 8 on Afterlife TV: I’m kicking off Season 8 of Afterlife TV with 3 new episodes, which you can listen to all at once (no waiting). This first episode is a rundown of where I’ve been, what I’ve been doing, and what is to come. I also talk about the role of an investigator in researching life after death, why no one has proven that the afterlife exists, and why some myths and fallacies about life after death are still being taught. Welcome back to Afterlife TV. Be sure to listen to episodes 2 and 3 right now, as they have already been posted. Below are the show notes for a the links mentioned in this episode. I’ll see you in the next episode. Loving gratitude to my wife, Melissa, for the use of all her gorgeous photographs for our video. Bob: Hey everybody. 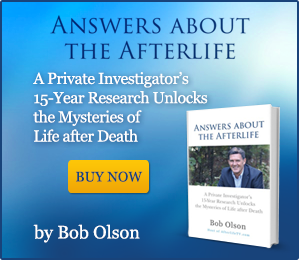 Bob Olson here, with Afterlife TV. You can find us at afterlivetv.com. This is where we talk about life after death and we answer the meaningful questions you have around that subject. Today’s episode is sponsored by Best Psychic Directory. You can find that on bestpsychicdirectory.com, pretty simple. Over 900 psychics, and mediums, and animal communicators, and tarot readers, even energy healers, all hand-chosen by me. 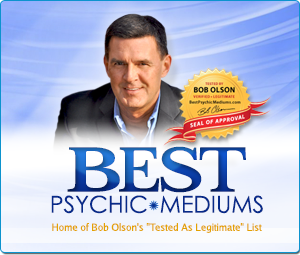 I’ve been testing psychic and mediums since 1999. Some of you might not even have been born yet. I don’t know. That’s actually very possible, isn’t it, sadly, for me. 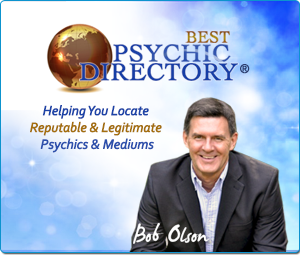 It’s extremely difficult to get approved for Best Psychic Directory. 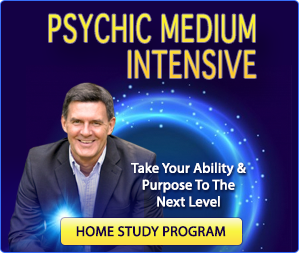 Most psychics and mediums today who apply are rejected, but that’s because my standards for what makes a good psychic and medium has risen over the years. Because I have tested so many people, analyzed, and documented, and compared, and even taught psychics and mediums how to give better readings, and so, it just makes it more and more difficult to get on there. But those who are there are obviously very special. So check out bestpsychicdirectory.com, where you can schedule a reading privately with these people, or you can get an instant reading right there on the site. All right. So welcome back my friend. I wanna thank you so much for your patience and waiting for a new episode, and there will be more. I am now back and here to stay. This is season number eight for afterlife TV. And those of you who follow me regularly, have been, sort of, loyal fans, I guess you could call it, or people who are interested in Afterlife TV subjects, and videos. For those of you who have done that, you know that the reason that I’ve been gone, is because my last book, “The Magic Mala” has been chosen by a movie producer so that they can make the movie about that story. I was surprised and also excited that the producer wanted me to write the screenplay, otherwise known as a script. I’ve been a writer for many, many years, but I’ve never professionally written a screenplay. So I hired a screenwriting mentor. Once a week I had to present 10 new pages, which we analyzed with a fine tooth comb. We would have our meetings every Thursday and go over the script. After that was finally done…that’s took months. I think it started in September, I was finally done with it in February. Prior to that, just before I finished, Melissa and I, my wife Melissa, for those of you who don’t know, who’s very much a part of the work that I do, we visited the movie producer in London. And this was in December. It was beautiful. Boy, London in December, if you have an opportunity to go, I highly recommend it. Boy, they really know how to decorate in that city. And what a beautiful city it is. We were able to go there, I had meetings with the producer so that I knew that I was moving in the right direction. Then after this first draft of the script was done, late April, Melissa and I, again, visited with the producer, now in Los Angeles, specifically in Beverley Hills. We lived there once, actually. Mellisa and I lived in Los Angeles in 1990. We only stayed there about a year, and we moved back to New England, but we loved that city, and we were very happy to be back there again. Going over the first draft of the script, making edits together, this wonderful collaboration. Any of you who are creative people, I know many of you are, if you’ve never collaborated with other creative people to create something, it’s an amazing experience, and I highly recommend it. I absolutely loved it. The producer, Melissa, and I, came up with new edits, things to change, things to add to the script, in which case I’ve been doing that. I can officially say now that the second draft of the movie is now done, and the producer was extremely excited about that, which is always a relief and exciting to me that I did a good job. Because I’m new with this, but I’ve had a lot of great teachers. The producer, my screenwriting mentor, and other people who are around me, that I know, who work in the movie business. So, the second draft is now complete, and we’re moving forward with that. We’re gonna be meeting with the producer. She’s actually coming here to our house, and we’ll go over edits for a third draft. In the meantime, every time I have a little bit of a breather, I will continue to make episodes for Afterlife TV. So you can expect them on a weekly basis. So that’s what I’ve been doing, that’s where we’ve been. And I’m very excited that, finally, after about four years…nothing happens fast. After about four years, the audiobook of “Answers About the Afterlife,” that’s my book that came out in 2014, the audiobook is finally done. Now, the reason that it took so long, was because I wanted to record it myself, you know, a lot of people like to have the author do it. Now, I do a lot more than write books. I have a lot going on, and because of that, the audiobook which was always on my list of things to do just didn’t happen. At one point I thought it was going to, and that all fell apart. So I finally got to the point where I said, “You know what? I’m gonna hire a voice-over artist, a voice-over talent, to read the book instead of me, so we can actually get it out there.” Of course, this means auditioning people so that you get the right voice, the right person, and they can do it in such a way that I feel as though it might even be better than if I did it myself. And in the case of the man that I chose, Alan, he absolutely did a better job that I could have. I’ve tried reading it here in the studio, and let me just tell you, that’s not as easy as it sounds. So, what we’re gonna be doing with the audiobook, not all the files, but…the book “Answers About the Afterlife” is really about 150 questions and answers about life after death. Things that people have asked me over…well, let’s just say I really started investigating in 1997, so a long time, that was a long time ago. People have asked me questions, and I’ve answered them. And I’ve written things down. I used to write a lot of emails when I had more time to answer questions for people. I don’t have time for that anymore, so I wrote this book. It took me three and a half years to write and edit this book, but it was finally done. Alan read it brilliantly. We’ll put links in the show notes so you can learn a little bit more about Alan. I think you’re gonna absolutely love his voice. It’s very soothing, it’s very comforting, and I think he does the content in the “Answers About the Afterlife” great justice. So what I wanna do for you because it’s been so long since we’ve had an Afterlife TV episode, I am going to actually upload to iTunes, and you can find this on afterlifetv.com as well, three episodes. So rather than you having to wait another week for another episode, because it’s been so long, I’m going to upload all at once three episodes. This is the first of the three. So what we’re gonna do in future episodes, is I’m gonna play questions and answers from the audiobook of “Answers About the Afterlife” and then I’ll comment on them afterwards, after you hear that, so I can add a little bit more to it. Now, this will take me three years, even if I did it weekly, three years for you to hear the entire audiobook. And even in that case, there’s gonna be things that you would miss. So if you’re interested, there’ll be links in the show notes where you can get the audiobook today, and just listen to it all the way through. Which is certainly what I hope you would do, and that’s the way it was written, is so that people would do that. But in the meantime, I’m gonna give you little bits and pieces from the audiobook in each episode. I’m gonna be skipping around picking questions and answers that I wanna present to you in that particular week. So you won’t be getting that from start to finish, but you’ll get bits and pieces of it here and there. But if you wanna hear the whole thing, and listening to Alan’s voice, you realize, “This is something that sounds great to me, I want more of,” then certainly check out “Answers About the Afterlife” audiobook, which you can find right there on Amazon or on audible.com. So what I wanna start with just in this episode, is I just wanna point out a few things that are in the introduction, that I think are especially important. Of course, the entire introduction, I think, is important or I wouldn’t have written it, but I’m gonna narrow it down to just a few things. I’ll read this to you, and then we’ll end this episode, and then you can go on to the next episode. I think it’s gonna be fun, and I think you’re gonna like it. And for those people who have sent me a lot of feedback either on social media, email, privately, I think that the one thing that many of you have said you get from the show on Afterlife TV, is that you find it comforting, and soothing in a way because you’re learning about life after death in such a way that it either helps you with the pain of loss, helps answer questions, what has happened with your loved ones who have passed on and gone to the other side. Or for many of you, you’ve said that you have been diagnosed with a terminal illness, and you fear death, and that I can’t tell you how many people have said that “Answers About the Afterlife” or this show has helped relieve them of their fear of death. And with all those kinds of reactions, I couldn’t ask for anything better. To me, that’s what it’s about as well. So in the introduction, a couple of things that I just wanna point out before we move on to the next episode is these paragraphs that I’ll read. “There’s one fact with which I must begin any introduction to a book, workshop or lecture about the afterlife, is that we do not know all the answers. Having said that, we do have a great deal of evidence about spirits, spirit communication, and the spirit world from which we can draw persuasive conclusions. And for the most part, these conclusions are true. However, they are not accurate. True but not accurate, simply means that these conclusions are true as far as our human minds can comprehend them, but they are not entirely accurate from the viewpoint of the spiritual realm. Nonetheless, our brains are of the physical world, so this is up to be the most complete understanding or capable of having. As times change and the veil between the physical and spiritual thins, it’s possible that we’ll gain a deeper understanding of life after death. Believing in our current reality, true but not accurate, still holds the power to an awareness that allows us to understand the really big questions about life, death, and spirituality. And that’s what this book is about.” Later in the introduction, I write this, “It’s important that I explain how I arrived at these answers. I’m an investigator, not a psychic, not a medium or a channelor, I’m also not a scientist. I’m an investigator who draws conclusions based on an examination of the evidence using logic, reason, and pragmatism. I begin my investigations without bias or expectation and draw conclusions only after gathering and examining the available evidence. In other words, I look at the evidence first and draw my conclusions second. Science, to an investigator, is mainly one means of gathering evidence, not an intended means of proving anything by itself. In a criminal court of law, for instance, scientific evidence is just one of the many pieces of evidence considered in determining an alleged criminal innocent or guilty. Judges and juries also consider physical evidence, witness accounts, motives, and past criminal histories, to name just a few. So this is also true when investigating the afterlife. Scientific evidence is merely one source of many. For example, double-blind studies of psychic mediums, provide valuable evidence that mediums have exceptional abilities for knowing facts that they couldn’t know if not for an intuitive ability. But no scientist has proven that mediums actually communicate with spirits. That would be a conclusion one would have to draw based on the evidence. And there’s one main reason that someone has yet to prove that the afterlife exists, it’s because proof is subjective, everyone must decide for himself. The process of the investigator has been used in our civil and criminal court systems for as long as those institutions have existed. The legal system that holds our society together depends on it. Logic, reason, and pragmatism, therefore, become part of the investigators’ skill. In this way, judges and juries resemble investigators too because they all look at the evidence, and base their conclusions using their own subjective reasoning. In fact, that’s how most of us navigate our way through life. We are each investigators of our own life. Making choices, interpretations, and decisions based on the evidence before us.” Let’s skip a couple of paragraphs here. “Because I’ve had the luxury of investigating the afterlife on a full-time scale for all these years, the answers in this book are as realistically accurate as anyone can offer. And because I’m connected with so many gifted practitioners, credible experts, and celebrated authors in this field, I also know what others have been teaching. So I’ll share with you what the most common beliefs are on a particular subject, even if they happen to be in conflict with my own conclusions. Because I sometimes disagree with what other people are teaching about the afterlife. I feel it’s important that you see all sides to every answer so that you can decide which answer resonates the most with your own experiences and beliefs. After all, it’s not what I have concluded, or what someone else believes that matters, in the end, it’s what you choose to believe that’s most important. The biggest problem I see occurring in this field is that people tend to pass along information about the afterlife without necessarily thinking it through. They simply accept it as true because someone else taught it to them, probably someone who learned it from someone else, who again, learned it from someone else. What they often don’t realize, however, is that some of these answers were invented based on outdated and erroneous beliefs and data that no longer make any sense. Yet few people question these outdated answers, so they keep getting passed along. For instance, a few psychic mediums teach about the afterlife based on what they learned from other mediums, not based on the evidence before them, meaning their own spirit communication. Once they learned a false answer from somebody else, it led them to misinterpret the evidence before them because they already had expectations. That is, they made the evidence fit what they already believed rather than looking at the evidence first and drawing their conclusions second as an investigator would do. Some of the answers in this book may very well shake things up in this field, that’s good, I want people to take a second look at the evidence before them, and likewise, take a second look at what they believe. Rather than continue to pass down the same outdated answers, it’s time that we all started questioning those answers and rethink them for ourselves. Consequently, you can read this book confidently knowing that this is not another rehashing of the same answers presented by others for hundreds of years. Therefore, if I’ve concluded an answer in this book that is in agreement with what you’ve already heard or read, you can be certain that that too has been squeezed through the ringer of practical analysis based on the latest evidence available. Knowing all this, I hope you’ll use this book to inspire your own investigation into the afterlife, rather than take my answers as the final word. Let my answers in this book help you to see the bigger picture, which might include two or three opposing beliefs so that you can draw your own conclusions. Since proof is subjective, all that really matters is that you determine what equals proof to you. Even if it’s different than what I believe or others believe, it’s what feels right and sacred to your life and spiritual growth that really matters.” So that’s the introduction. Of course, it also explains a lot of the evidence. I think there’s maybe 17 different things that I really talk about at the end of that introductory chapter that gets into detail. Things that you could all look at, experience on your own, evidence-based experiences that I think could be very valuable to you in coming up with your own choices and beliefs about life after death. So I think that’s a great way to start our journey back to what we do here on Afterlife TV. Check us out again at afterlifetv.com. 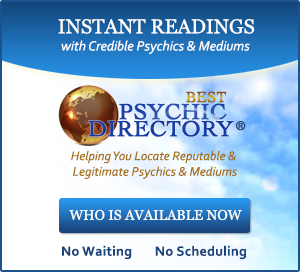 Check out the sponsor bestpsychicdirectory.com, for an experience of your own with someone who is extremely intuitive or is able to communicate with people in spirit. And check out “Answers About the Afterlife” or my latest book, “The Magic Mala” which has an afterlife theme to it. In fact, in that book, there are two dream visitations, a spirit connection during a meditation, and lots of after death communications known as ADCs, which we’ve talked about here on afterlifetv.com. Also, I wanna thank anybody who has left reviews for those books. I read them, and I really enjoy the fact that these books have been so meaningful, and helpful, or comforting even, to you and your life. So thank you so very much for leaving reviews there, I really appreciate it. If you wanna comment to me on Facebook, Twitter, afterlifetv.com, allows comments as well. There’s lots of places that you could communicate with us. I hope you’re happy that we’re back, I know that I am. And I look forward to chatting with you more about various subjects about life after death. There’s two more episodes waiting for you. Thanks so much. All right, bye bye. Announcer: That’s all for another fantastic Afterlife TV episode. Bob couldn’t be happier. If you enjoyed this episode as much as Bob, please leave a comment on afterlifetv.com, Facebook, Twitter, or YouTube. 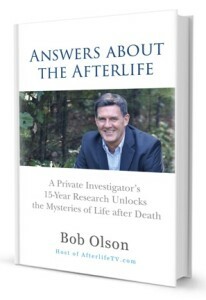 And don’t forget to check out Bob’s book “Answers About the Afterlife.” Thanks for watching Afterlife TV.